The Premium Selection. Our premium basket is delivered brim-full with delightfully fresh fruit, flavorful sausages, as well as a selection of cheeses and crackers. We also tuck in a sweet chocolate treat to round out the selection. 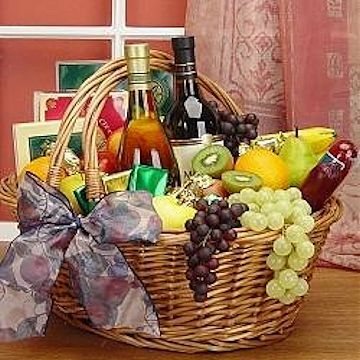 You may choose either one or two bottles of Chardonnay or Merlot to complete your gift. Each basket includes regional gourmet specialties and wines to make them truly unique. The Premium Selection has been purchased most frequently by our customers for the following occasions: Christmas, Corporate Gifting, Thank You, Birthday, Sympathy, and Get Well.